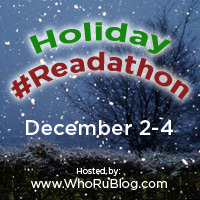 Click here for more information about the read-a-thon! It is way too early to be awake considering how late I stayed up reading! Last night I was interrupted during my uninterrupted reading time (of course! ), so I ended up finishing The Running Dream while I was supposed to be sleeping. That's pretty much par for the course, but I'm still tired! In addition to The Running Dream, I also read the first couple chapters of the next selection on my White Christmas list, but I wasn't really feeling it so I'll be moving on to the next one. I think it's Possession by Elana Johnson. Not sure how much time I'll have to read today, though. I really need to do final edits on my paper from hell, not to mention the dog needs to go to the vet and I'm seeing Breaking Dawn with my best friend. Busy busy busy! We'll see what happens! Well, I was going to start Possession this evening, but then I remembered that I just got an ARC of The Other Life by Susanne Winnacker (the pretty UK version!) and just had to pick that one up! I literally devoured that book. I'm in literary love. Aww!! I haven't heard of The Running Dream, but the title sounds pretty interesting! Hehe. Good you finished the book! Lol. Thank you for sharing! Thanks, Sam! Hope you're having a great read-a-thon as well!